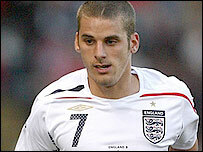 Blackburn's David Bentley has defended withdrawing from the England Under-21 squad for this summer's European Championship's because of fatigue. Bentley's commitment was questioned by boss Stuart Pearce after the move. "I think it is for the betterment of my career," said Bentley, who is hoping to be selected for the senior squad for Euro 2008, should England qualify. "I owe a lot to the Blackburn fans too and they are paying the money to watch me week-in and week-out." Pearce will not be able to replace Bentley as a manager can only bring in another player if a withdrawal is because of injury. Bentley told Pearce, who drafted the playmaker back into the U21 fold after taking the helm recently, of his decision in person. "He was disappointed as a manager should be and I fully accept that it was a controversial decision," Bentley told Talksport. "I love playing for England, I love my country; every time I step out on the pitch I give my all for anyone I play for. "If you look at my under-21s career I have never not given my all for it. "I had three decisions; the club could have pulled me out, I could have pulled myself out or I could have faked an injury. "I am an honest lad, I'm not a robot and I wanted to give my decision and my opinion on it." England's senior team boss, Steve McClaren, recommended Bentley should play after using the player as an unused squad member for the recent games against Brazil and Estonia. "I look up to him and I have great respect for him but I have to listen to what my body is telling me," said Bentley. Bentley sought the advice of members of the full England team about the effects of playing a summer tournament and says that had an influence on his decision. "I've never come off a 60-game season and then gone straight into another one, I was alien to it. "It wasn't a rash decision, I asked senior players at England 'what do you feel like come October or November?'. "They said 'you hit a brick wall'. They also said 'if you want to be firing and you want to make a push for the European Championships next year then I really think you have got to think long and hard'."